I was fortunate enough to attend the 14th Annual Strategic Sourcing & Supplier Relationship Management conference in Chicago, IL, which featured a host of top executives discussing ways to drive competitive advantages through better, more collaborative supplier relationships. One of the main themes explored throughout the two-day event was how to build and deploy a successful Procurement Transformation. In what was quite possibly the most enlightening keynote session, Terry Simmons, Vice President of Purchasing and Supplier Management at AbbVie, recounted how AbbVie has continued to modernize their entire procurement division to maintain a competitive advantage in an ever-changing market. I had the opportunity to interview Terry to take a deeper dive into some of the lessons learned throughout the change initiative thus far. Having embarked on a complete evolution of Procurement, Terry spoke to the trials and tribulations of redesigning their procurement and supply management processes, but the key takeaway from our discussion was that the impetus for a truly successful Procurement Transformation are the people. Kaitlyn Krigbaum: It sounds like a lot of changes are underway at AbbVie—embracing the culture of digitization, greater alignment across the enterprise, and even greater inroads in supplier innovation through more strategic relationships. It’s clear from an outside perspective that AbbVie has come a long way in the last five years, but it begs the question: where did you begin, and what best practices can you share with other companies looking to rollout a similar holistic transformation plan? Terry Simmons: One piece of advice is to stay true to your vision or mission as a company. Our vision is to be recognized for delivering consistently innovative medicines that have a remarkable impact and change people’s lives for the better. We’re truly patient-focused, and kept this ideology at the forefront throughout the development of a transformation strategy. By creating a sense of purpose behind the work, people work harder. Another key element to a successful Procurement Transformation is starting with where you actually are, not an idealized state. For instance, we built out a five year roadmap, and to use a sports reference, we had a great “playbook” and knew our opponent [targets procurement needed to hit], but we needed to have the right team to execute on that playbook. We began by evaluating our people, and whether everyone was in the right role where they could make the greatest impact. If not, we moved them to a role that was a better fit. Kaitlyn Krigbaum: So building a high-performing team is imperative to the success of a change initiative. My follow-up question would be how do you successfully develop a team? Terry Simmons: It’s really a matter of knowing the personality of the organization, and managing your team the same way you coach them. Our culture is the foundation of our success. A good leader takes a different approach towards the development of their team. Career advancement requires unique approaches, rather than a one-size-fits-all management approach. Take introverts versus extroverts, for example. For extroverts, the focus may be on getting them to channel their energy and be a processor, whereas for introverts, it may be not only building their knowledge, but sharing their insights with the broader team, since so often they act as the sponge of the group. I tell my team to “be curious”—network, look at what other departments do, analyze other roles, and determine how we as a function can better support them. As a leader, successfully developing a team is often a matter of knowing how far to stretch people, and recognizing their potential even before they do. At AbbVie, we encourage diversity of approach and a culture of inclusiveness. We encourage spontaneity and stress the danger of stagnation. Different types of people find harmony as categories continue to merge throughout a transformation rollout. Kaitlyn Krigbaum: That makes sense to me, build the right team with the right leader and you’re on your way towards a successful Procurement Transformation; however, the leader and the team are both Procurement specific, it seems. Is there anything you recommend doing early on to increase awareness of the change initiative and the value Procurement can deliver to the rest of the organization? Terry Simmons: We strive to leverage our relationships with key business stakeholders to ensure a clear understanding of the upcoming change and how it benefits or affects their organization. While having those conversations well in advance can be a challenge, we have found that when we do, it gives both leadership teams an opportunity to discuss the best approach for the respective organizations. Knowing the barriers to success at the front of the change initiative gives the organization time to re-adjust the approach to fit a specific organizational business need. Kaitlyn Krigbaum: Great, thank you for sharing some key insights. Any parting words of advice to organizations as they rollout their own Procurement Transformations? Terry Simmons: Set expectations up front with the Procurement team and other stakeholders, and leverage your pull—try to use all levers—rather than pushing an agenda. Allow people to fail – failure is often the journey to success, and as long as people are learning, it’s a worthwhile part of the experience. Keep people engaged for the long run, and continually monitor progress. This interview has been edited and approved by AbbVie. Terry joined Abbott Laboratories in 2012 as Vice President, Purchasing and Supplier Management and as of January 1, 2013, he assumed these duties for AbbVie. He has an extensive background in total procurement and supplier management, including experience with both domestic and international purchasing. He re-joined Abbott Laboratories in 2012 from Baxter, where for five years he was Vice President of Global Purchasing. 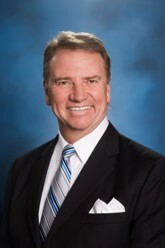 Prior to his tenure with Baxter, Terry served as Vice President, Purchasing and Real Estate at Hospira, Inc. He has also held positions of increasing responsibility in procurement, administration and sales with McDonald’s Corporation and Abbott Laboratories. Terry received his bachelor’s degree in communication from the University of Minnesota. He is an active member of the National Association of Purchasing Managers and the AMA Purchasing and Supply Chain council as well as collegiate affiliations in Illinois and Minnesota.